In December Tony Barnosky and Liz Hadly attended the United Nations Conference on Climate Change (COP21paris.org) in Paris to premiere a movie opening, "Demain." 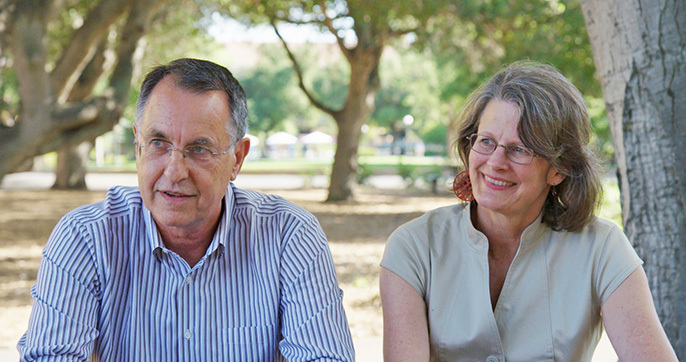 The movie was inspired by the research of Tony, Liz, and their colleagues on tipping points. The film opens with Tony and Liz summarizing global change issues facing the world today. Tony states, "The movie is all about solutions and is very uplifting. It features solutions being implemented in San Francisco and Oakland, in addition to many other places around the world." It was produced by and stars Mèlanie Laurent (a well-known French actress) and Cyril Dion. The movie is getting rave reviews in Europe and the English version, "Tomorrow", has an anticipated release date of spring 2016. Members of the Barnosky Lab continue to be sought after for interviews in response to their ongoing research documenting the dramatic loss of megafauna and the significant impacts on landscapes and ecosystems. In August, Carole Hickman was honored by resolution of the Council of the American Malacological Society as an Honorary Life Member in recognition of her research, service to the Society, and her teaching and mentorship. While there, she also presented a paper on adaptations of extremophile bivalves to life at ancient and modern methane seeps in a marine mollusk symposium. In June, she presented a paper on the future of systematic monography at the Annual Meeting of the Western Society of Malacologists at Cal State Fullerton. Kevin Padian spent a week at UT Austin with Jim Cunningham working on the functional morphology and flight of the giant pterosaur Quetzalcoatlus. He was also at Ghost Ranch, New Mexico, where the crew unearthed four new skeletons from the Triassic Hayden Quarry. Joining the field party were UCMP alums Randy Irmis, Sterling Nesbitt, and Sarah Werning, as well as UCMP undergraduate Ben Kligman and UT graduate student Adam Marsh, who visited UCMP for several weeks in spring 2015. Welcome to Julia Sigwart, a Museum Associate and sabbatical visitor from Queen's University Belfast, Ireland. Julia is an Associate Professor and Director of the university marine station in Portaferry, Northern Ireland. With full support for the next three years from a Marie Curie Fellowship, Julia will be based at UC Berkeley collaborating with UCMP Director Charles Marshall and Professor Emeritus David Lindberg. Julia's research focuses on macroevolution in marine invertebrates, using both fossil and living species.